If you want to add some rustic flair but still keep it simple, Mexican tiles in "Acapulco" style is your ideal option. This Southern folk inspired tile presents dark blue and terracotta talavera design over white background, perfect for the backsplash or counter. Shipping from Mexico to the US and Canada is estimated for four weeks. To truly appreciate the beauty of this pattern you need to lay down at least a square foot of tiles. 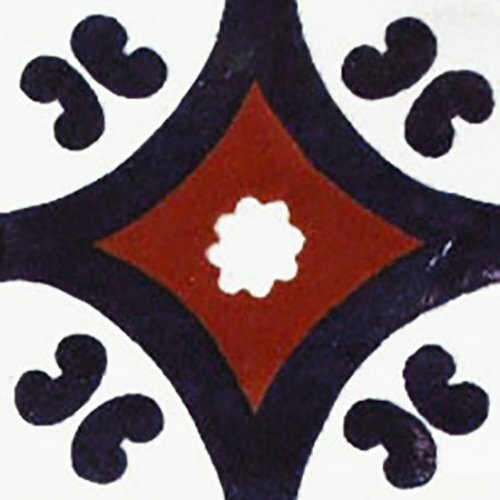 The design is made of white circles otherwise not visible by looking at a single tile. Thank you for customizing our order and painting the navy blue elements of the pattern in black. Mexican tile with Acapulco design is what I decided to use on our kitchen backsplash as well as the counter. I have terra cotta color floor tiles very similar in color with the tile pattern inside. Also I used cobalt bullnose on the counter edges which were painted with the same blue color the remaining portion of the tile design. Tiles from Mexico are amazing and I love my kitchen more than ever before.